Discover our different workflows for astrocytes and find the one that fits your experimental needs. Listen to Melanie Jungblut, Ph.D., in her webinar and learn how to reliably characterize neonatal and adult astrocytes with novel monoclonal astrocyte-specific antibodies. The Adult Brain Dissociation Kit helps to remove cell debris and erythrocytes to acquire clean single cell suspensions for downstream isolation of astrocytes. 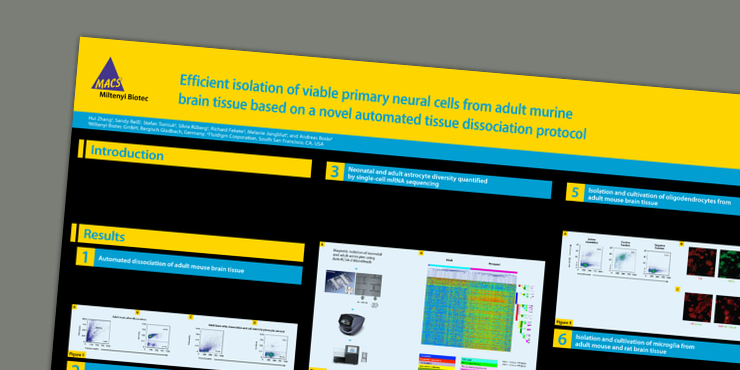 The gentle dissociation of P4 mouse brain tissue with the Neural Tissue Dissociation Kit (P) results in a high percentage of viable cells. The MACS® MicroBead Technology in combination with Neural Tissue Dissociation Kits allows the isolation of pure neonatal astrocytes in one hour. 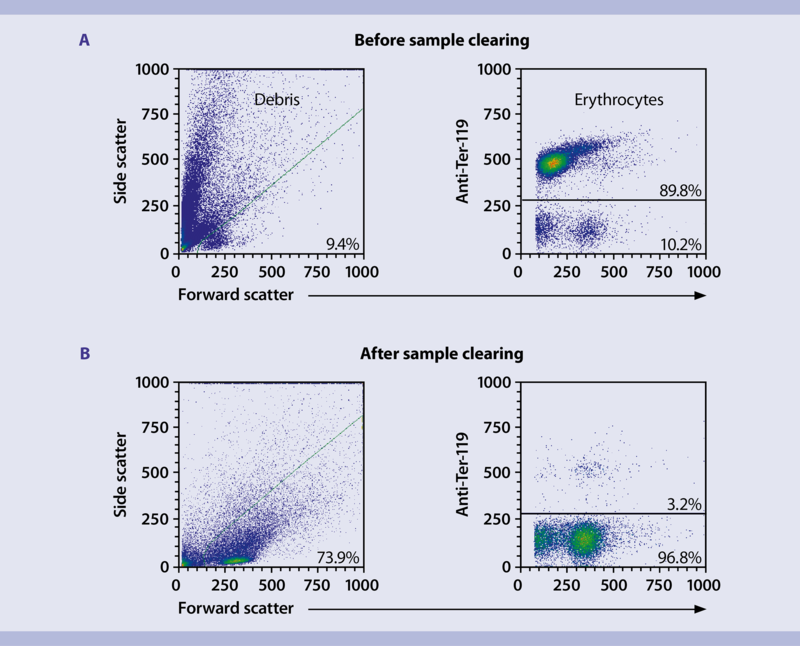 Using astrocyte-specific MicroBeads based on the novel anti-GLAS (ACSA-1) or anti-ACSA-2 monoclonal antibodies results in purities over 90%. 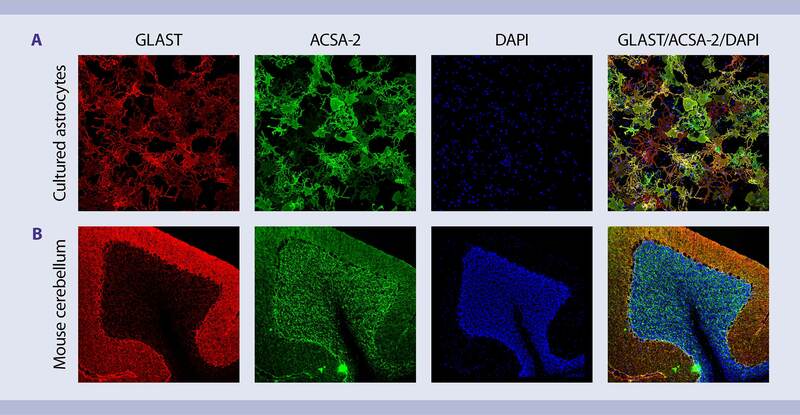 Highly pure and viable adult astrocytes can be isolated from single-cell suspensions obtained with the Adult Brain Dissociation Kit, mouse and rat by using the Anti-ACSA-2 MicroBead Kit, mouse. Isolation of adult astrocytes. A single-cell suspension from 3 months old mouse brain was prepared using the Adult Brain Dissociation Kit, mouse and rat. Adult astrocytes were isolated from the single-cell suspension with the Anti-ACSA-2 MicroBead Kit, mouse. 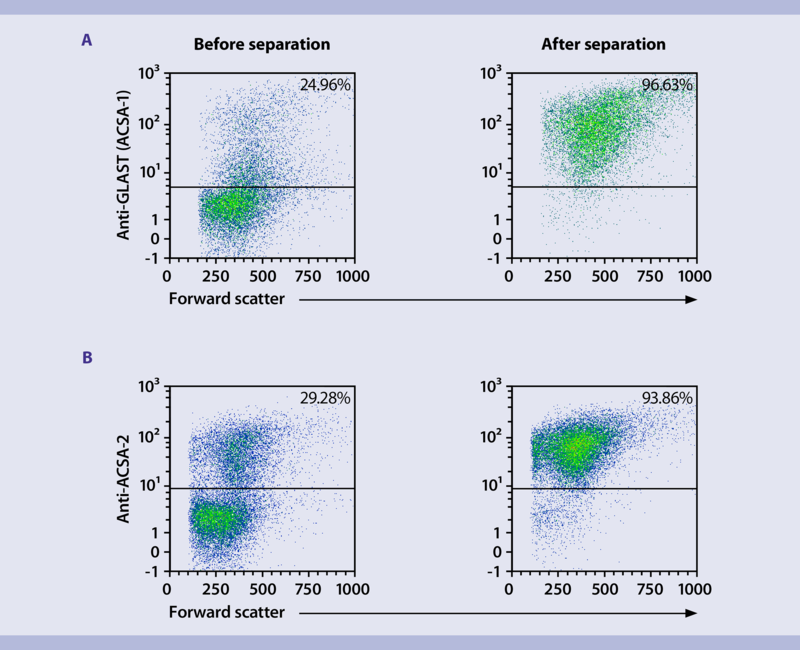 Cells were fluorescently stained with the Anti-ACSA-2 antibody and analyzed by flow cytometry using the MACSQuant Analyzer. 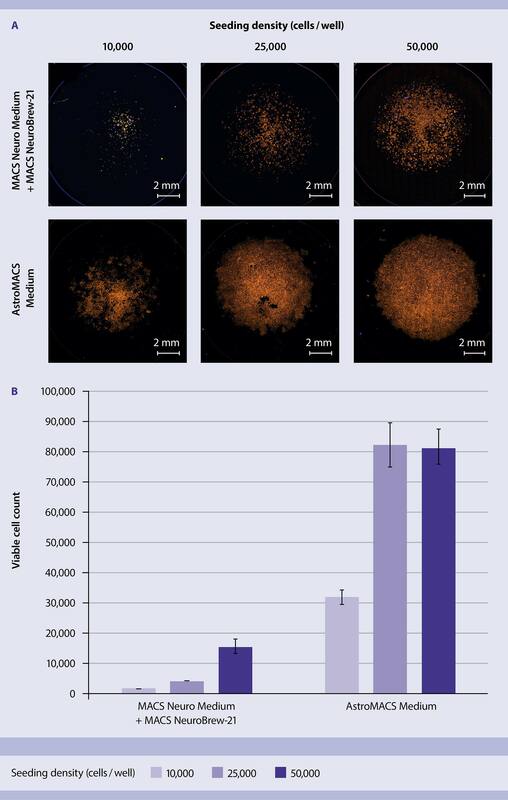 Astrocytes cultured in AstroMACS Medium show an increased expansion rate. Hence, superior astrocyte growth is achieved even when seeded with low density. (yellow) and DAPI (blue) and dead and viable astrocytes were analyzed with the Cytation™ Cell Imaging Multi-Mode Reader. (A) Microscopy images of one representative well. (B) Quantitative data of 4 replicates. Neonatal astrocytes were isolated from P4 mice using the Neural Tissue Dissociation Kit (P) and the Anti-ACSA-2 MicroBead Kit, and cultured in AstroMACS Medium at a density of 10,000 cells / well in a 24 well imaging plate for 7 days. Cells were then fixed and stained with Anti-GLAST antibody (green) and DAPI (blue). AstroMACS Medium allows enhanced adult astrocyte culture together with the new AstroMACS Separation Buffer, which removes dead cells during cell separation and provides a healthy culture environment. Adult astrocytes were isolated from the brain of 8-week-old mice using the Adult Brain Dissociation Kit and the Anti-ACSA-2 MicroBead Kit in combination with (A) or without (B) the AstroMACS Separation Buffer. Cells were then cultivated in AstroMACS Medium at a density of 100,000 cells/well in a 24-well Imaging Plate for 7 days. Cells were fixed and stained with Anti-GLAST antibody (green) and DAPI (blue). Specific antibodies are essential for reliable neural cell studies, especially for cell types with high diversity, such as astrocytes. The monoclonal ACSA-2 and GLAST antibodies are pan antibodies and recognize both, non-reactive and reactive astrocytes. PFA-fixed cultured astrocytes from neonatal mouse brain (A) and cryosections of PFA-fixed adult mouse cerebellum were stained with Anti-GLAST pure (red), Anti-ACSA-2 pure (green), and DAPI (blue); and analyzed by confocal microscopy. ACSA-2 is co-expressed with GLAST in the cerebellum, but showed a brighter expression in the granule cell layer. A detailed staining protocol is available for download on the right. Jungblut, M. et al. (2012) Isolation and characterization of living primary astroglial cells using the new GLAST-specific monoclonal antibody ACSA-1. Glia 60 (6): 894–907. G. Kantzer, C. et al. (2017) Anti-ACSA-2 defines a novel monoclonal antibody for prospective isolation of living neonatal and adult astrocytes. Glia 65(6): 990–1004. Batiuk, M. Y. et al. (2017) An immunoaffinity-based method for isolating ultrapure adult astrocytes based on ATP1B2 targeting by the ACSA-2 antibody. J. Biol. Chem. 292(21): 8874–8891.